A versatile system that boosts your summer bag down to -7°C. The Wafer gear will help to keep you warm around camp, then at night it joins the Filler bag as another booster inside the Ultra bag. The combination of these three down layers will give you a night-time performance of about -7°C, enough for most winter races in the UK. ​Main Sleeping Bag: Minim Ultra K (Sleep Rating: +8°C / 46.4°F) Weight 330g/12oz. A highly versatile system that will cope with UK races all year round. For much of the year you will only need to carry one bag: either the Filler, which is a super lightweight for the warmest nights, or the Ultra, which is a great summer all-rounder. 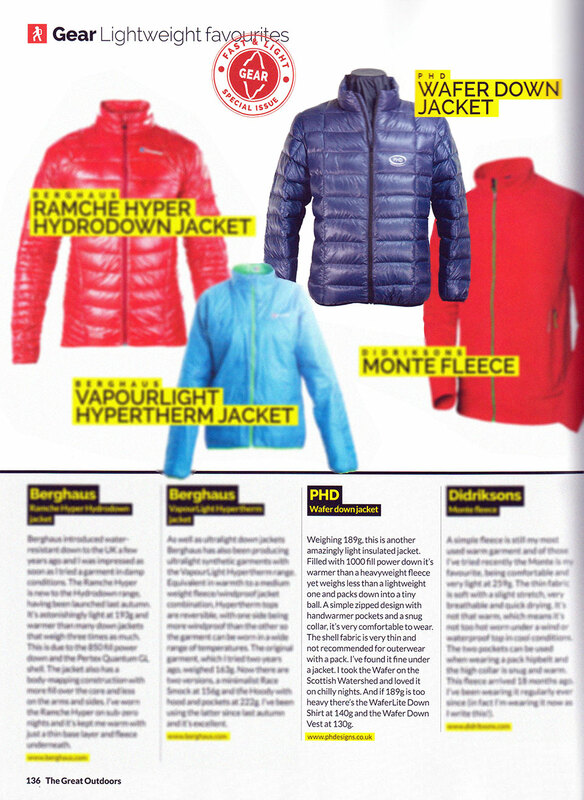 For colder conditions combine the Ultra with the Filler or with the Wafer clothing. Then put all three together for winter races. This system allows you to make your final decision about how light you want to travel by the weather forecast. Cold Races: If you're heading somewhere really cold, you can extend the performance of the Ultra (or Racer) bag down to -15°C or -20°C with Sleep Systems. But if it's going to be colder than that, as in the Yukon, look at the System we have put together for Cold Racing. "This is the smallest-packing, quality down sleeping bag I've seen. It fits into a jacket pocket. I've been as warm in this as I have been in bags twice the weight." "It is a pleasure, when you know the temperature is dropping, just to slip into another bag and double the warmth factor." "Amazingly light … packs down into a tiny ball. It's very comfortable to wear. I took the Wafer on the Scottish Watershed and loved it on chilly nights." — TGO Magazine's Gear Editor, Chris Townsend. Read Chris' full review. "I wore my wafer trousers for three days non stop … never climbed in such horrific weather and conditions." — Jon Griffith climbing Link Sar, Pakistan. Temperature ratings: The standard ratings we quote for our sleeping bags are for night time. But our standard clothing ratings on the website are for daytime use and provide no guide to clothing performance when sleeping at night. So when different items are combined, all Sleep Systems ratings are adjusted to night time use. To clarify this point all the temperatures quoted for our Sleep Systems are called Full System Sleep Ratings. The usual rules about appropriate ground insulation apply. The Full System Sleep Ratings quoted for various combinations of sleeping bag and clothing in our recommended Sleep Systems are as accurate as we can make them from experience, experiment, theory and test. We try to err consistently on the cautious side and to build in a small margin (see this Case Study when we tried Ultra/Minimus clothing inside a bag rated at -5°C in a Cold Store: that particular combination of clothing and bag was enough to provide a warm night right through at -21°C, but we have given it a rating of only -15°C in Sleep Systems). However it's always worth taking your metabolism into account when putting together your own system. If your metabolism is 'average', the Full System Sleep Rating aims to give you a good night's sleep at that temperature under normal circumstances (see more information on our temperature ratings). If you sleep cold, it may be worth deliberately choosing a warmer combination than normal. Also if your trip is going to be very long, remote or prone to stormy weather, it may be worth building an extra margin into your Sleep System gear choices to allow for these factors, as you would with any gear. One of the real advantages of Sleep Systems is that you can put together such a variety of choice from a few pieces of kit that you should be able to cover a wide variation in conditions. For a full picture see also 'Cautionary Tales', 'Widths', and 'Deterioration of Gear' in this Tech Info section. Our Recommended Systems are ‘average’ collections which should suit most people. But we recognise that there will be those at both ends of the spectrum who may want something different. Experienced ultra-lightweight enthusiasts, whether racers or climbers, can sort out for themselves how far they want to trim the gear. While first-timers may find the idea of going to 8000 metres with a sleeping bag with only 600gm of down a bit daunting. At either end the decisions are yours, but we will be happy to help if we can. Sleep Systems based on clothing provide warmth for the lower half of your body at the same insulation level as the named jacket or suit. These items are needed for the system to work – cold legs and feet make for poor sleep (see this Case Study). The lower-half options will usually be down trousers and socks or a halfbag. Halfbags are simpler and lighter, but don't offer double value as daytime wear like down trousers. There are other activities when people camp. Long kayak trips and bike touring are two of them, which fall right into the area where Sleep Systems can be of real use. It's not just the overall weight reduction: even more important for both of these pursuits is the possibility of dividing your sleep gear into small packages rather than one big one (see this Case Study). You may of course be doing something altogether different, something we haven't covered. If so, we'd be interested to hear of it and we'll do our best to advise you how to get the best value out of your sleep system. The same rules apply to Sleep Systems as to any other gear. If you are going on a very long trip (North Pole) or a potentially cold damp one (Patagonia), where you can't stop to dry out your kit, then consider putting synthetic insulation into your mix. For example a Zeta Overbag as an outer might well pay off in those conditions, while it would be unnecessarily heavy as part of your system for most camps and climbs. Even Scottish winters may make synthetics worth a second look. This is not strictly within the brief of technical info for Sleep Systems, but the following comments may be of use. Wet clothing always raises a new problem at night time, whether valley camping or on UK and other low/medium mountains. How to deal with it? In theory the best advice is don't get into this situation, but it can happen. So if it does, how does it affect our Sleep Systems ratings? How wet are you? Drenched to the skin or just damp outer clothing? a) Drenched: You shouldn't be drenched if your outer gear is up to the job, but assume it's happened. Tough call, especially if you've got more nights out to follow. You need the two basics - shelter, that is a tent or waterproof bivvy or even a cave or snowhole, and a dry sleeping bag: if you haven't got both of these, you could be in real trouble (forget our advice and survive). With the basics you have two options. Sleep in all your clothing (wring it out first! ): your base layer might dry out overnight, but the rest won't. Wet clothing is a poor insulator and you'll also be pushing moisture into the insulation of your sleeping bag by direct contact and evaporation. You'll have to reassess your situation the next day, taking into account the state of your gear. Probably the better option - sleep in just your base layer: less thickness, but you've got a fair chance of drying it off overnight. And if your sleeping bag has a water-resistant outer, you can wring out your outer gear and lay it over the top of the bag - it should add a little more warmth. As with the first option, reassess in the morning. Sleep Systems: Our ratings do not apply to this situation. If your bag starts off dry, it should perform close to its normal TOT rating (evaporation from damp clothing will remove some warmth from the body), until it absorbs too much moisture. b) Damp outer clothing: Same options as if you were drenched, but a much better starting point. Assess just how damp the layers are and wear anything reasonably dry. Anything beyond mildly damp, drape it over. Sleep Systems: Our standard ratings do not apply even to damp clothing. A dry sleeping bag should perform close to it's normal TOT rating and should maintain that through most of the night as there will not be much moisture evaporating into the insulation. Naturally Primaloft clothing will come closer to full performance than down. **Liners: A proofed bag liner will improve your situation. A VBL will add some warmth, but will not allow any evaporation, so any clothing inside will be just as wet in the morning. An Ultrashell liner is much lighter, will stop moisture transferring to your bag by direct contact, and will allow some drying inside overnight: overall probably a better bet. For Sleep Systems which include thick down clothing, we have nominated a Wide main sleeping bag to enable the system to work properly. The extra width is needed to allow the clothing to loft (see this Case Study). If you are putting together your own system, all our Overbags are wide and the Minim, Hispar and Delta bags are all available as Wide or Extra Wide. Note: If you would normally order a Wide sleeping bag for yourself, our advice about increased width to accommodate your clothing may mean that you will need an Extra Wide. If in doubt, contact us with your query and we'll try to help. The temperature figures for Full System Sleep Ratings shown on the PHD website when combining items for a sleeping system are intended as a guide only to assist you in making your own choices. While they are as accurate as we can make them, it is impossible to cover all the variables. The combination of personal metabolism, food intake, ground insulation, humidity, and altitude are among the many factors which can seriously alter any rating. Accident or exceptional weather may also change the parameters of any venture. Personal experience is the best basis for your gear choices, coupled with expert advice on your venture when necessary. Any failure of materials or workmanship is fully covered by PHD's standard lifetime guarantee alongside your statutory rights. However PHD accepts no responsibility for the suitability of combinations chosen by customers for their personal ventures. Caution: On long Polar journeys or multi-bivouac siege routes sleeping gear may deteriorate and it is important allow for this and plan for it. 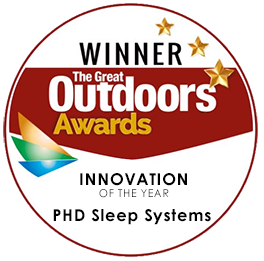 We have only included 6 of our PHD sleeping bags as the basis for our Recommended Sleep Systems. These are our core bags which offer the most efficient performance, with ratings ranging from +8°C down to -21°C as stand-alones. Sleep Systems transforms them into a range which will cover you for any temperature you want right down below -50°C. You can customise the length and width of any of these bags. Add in the different zip and fabric options and you have hundreds of bags to choose from. Self-built Systems: However if you already have different PHD gear or would prefer to buy items that are not shown, contact us with your query by phone or email and we'll do our best to advise you. We are unable to comment on gear from other manufacturers. Comparisons between sleeping bag weights are shown in the Recommended Systems which feature clothing as the only ‘Plus’ item. These figures refer to the weight of your Main Sleeping Bag and nothing else. This allows a simple comparison with the weight of the single main bag you would have to carry to achieve the same temperature rating as that System (most of the bags used for this comparison are taken from the lightest and nearest equivalent on our Design-Your-Own sleeping bag site). Of course clothing also has a weight, but the clothing we quote is what you would normally take with you and use in the daytime on that kind of trip, whatever sleeping bag you choose to carry. So clothing is ignored in this calculation. No weight comparisons are given for Systems featuring Filler, Overbags, or Halfbags as Plus items. The main value of these Systems is that they are extremely versatile and packable compared to a single big sleeping bag, and often carry an added safety margin. Also these items may or may not all be in your sac on different trips, which makes weight calculations complicated (See Case Study from Broad Peak when Ben Kane chose to sleep in his overbag and left his main bag behind!). Clothing and Lower Halves: Sleep Systems based on clothing provide for warmth for the lower half of your body at the same insulation level as the named jacket or suit. The lower-half options will usually be down trousers and socks or a halfbag. Halfbags are simpler and lighter, but don’t offer double value as daytime wear, as down trousers do. These items are needed for the system to work -- cold legs and feet make for poor sleep (for example, see this Case Study). Hoods and Hats: Hoods are an option for PHD’s lightest jackets and pullovers, Wafer, Ultra, Minimus, and Alpine Ultra. When selecting a sytem that includes one of these top halves, you will need the hood (or a down hat) to achieve the Full System Sleep Rating (for example, see this Case Study).